Refashioning new sleeves on a sweatshirt. I used two types of fabric remnants to create more textures and visual interest to the layered sleeves. This DIY project is inspired by a garment upcycling feature in Koko Yamase’s “Kakkoii Couture Remake” book. 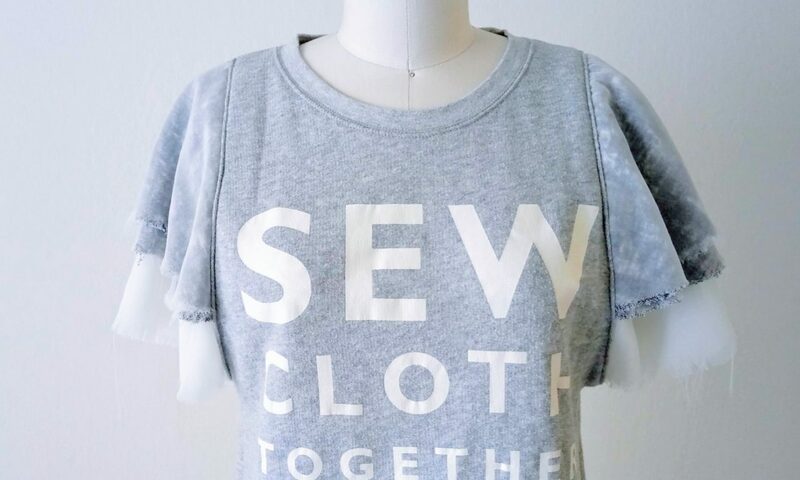 The main materials for this DIY Fashion project were Uniqlo x Merchant & Mills sweatshirt, a gray/white knit fabric remnant, and polyester chiffon fabric remnants. A piece of cotton scrap, transfer paper, tailor’s chalk, and tracing wheel are used to transfer self-drafted patterns. French curves and basic machine sewing supplies completed the list. After a few hours of trials and errors of making and revising the initial plan, the layered flounce sleeves have replaced the original long sleeves of the sweatshirt. The unfinished chiffon edges add beautiful fraying textures. Read more about this project on DIY Layered Flounce Sleeves post. Refashioning flounce sleeves to an old sweatshirt using fabric remnants. Knit and chiffon textures add visual interest to a basic garment.